Felix is a much-revered director who is ready to present his vision of The Tempest at the Makeshiweg Festival. But his devious assistant convinces the board to fire him, so he can take Felix's place as artistic director. Felix descends into depression and isolation with only his imagined daughter Miranda. Years later, he takes a job teaching Literacy through Literature at the Fletcher County Correctional Institute. Felix teaches the inmates about Shakespeare, with the goal of finally bringing his Tempest production to life. And maybe in the process, he can finally get revenge against the men who ruined his career. As an English and Theatre major in college, I am very familiar with The Tempest. It must be difficult to re-imagine a classic play that is so beloved by so many people, but Margaret Atwood is an excellent choice for the job. While this story is not a direct update of its source material, there are obvious parallels; Felix is reeling from loss and betrayal and he deeply loves his daughter Miranda, although in this version, she has been dead for many years. 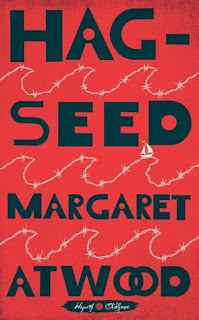 I would have read a Margaret Atwood story about a man's fall from grace and the power of the arts all on its own, but finding all of the ways the story references and intersects with its source material makes a great reading experience a lot of fun too. We even get to imagine what happened after the final words of the play. Felix is committed to teaching the inmates just how much Shakespeare has to say about their lives, explaining that the play they will perform is all about power and prisons. As Felix watches his cast experience The Tempest, we see that even the most seasoned of Shakespeare performers and scholars can find new things each time they open the text. As we read Hag-Seed, whether it's our first time with Propsero or the fiftieth, we have that chance to discover it anew too. Hag-Seed is a part of Hogarth's collection of Shakespeare re-tellings. Here are my thoughts on Vinegar Girl, a retelling of Taming of the Shrew. It's Monday and it's been a long week. It's Monday and we're going to have a snow day!